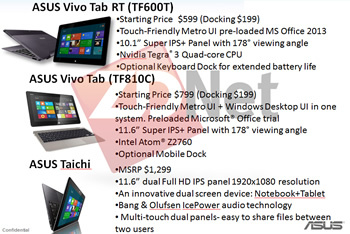 Today, a supposedly leaked roadmap slide has given us a glimpse of Asus' upcoming Windows 8 tablet line-up but more importantly: their prices. The three models -- Asus Vivo Tab RT, Vivo Tab and Taichi -- will weigh in at a stiff $599, $799 and $1,299, repectively. ZDNet's Larry Dignan believes those high prices will hurt consumer interest in a big way -- I'm inclined to agree, but it's worth mentioning that Asus' hardware is fairly robust. The most budget-minded model, the $599 Vivo Tab RT, features an Nvidia Tegra 3 quad-core CPU, a 10.1-inch "Super IPS+" display, 32GB of internal storage and comes bundled with Windows RT and Office 2013. Windows RT, in case you haven't heard, is the feature restricted, tablet-centric version of Windows 8. It's worth noting that Asus already packs Super IPS+ panels into its Transformer line-up, so don't expect anything too ground breaking. Super IPS+ panels are essentially really bright screens which fare better in bright, outdoor environments, but aren't necessarily high-density PPI screens like Apple's Retina display. Sure, the inclusion of Microsoft Office 2013 might play a role in the expense of the Vivo Tab RT, but the Taiwanese device-maker will likely have difficulty competing against the industry-standard iPad which retails for only $499, let alone numerous budget offerings in a similar size/price category. In terms of price, Asus may even have problems with Microsoft's Surface. Yesterday, Microsoft's CEO gave us the sweet spot for Surface pricing: $300 to $800. It's a cavernous price range spanning a $500 divide, but if Microsoft's own tablet is going to plumb $300 depths for similar hardware, the Vivo Tab RT might be a really tough sell. The $799 Vivo Tab will be powered by an Intel Atom Z2760 and run the full-featured Windows 8 -- not the watered down tablet edition -- on a 11.6-inch screen. The Vivo Tab excerpt states, "Preloaded Microsoft Office trial", but that is especially curious since the $599 Vivo Tab RT appears to come with the full version. Although the slide doesn't say it, this tablet is expected to have 64GB of internal storage. The company's flagship tablet, the Taichi, will also feature a 11.6-inch panel -- two of them, actually. This 1080p, dual-display, Transformer-like device is set to include a premium sound system but little else is known other than the price tag in the slide: $1,299.